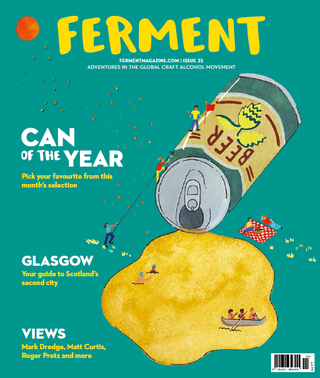 Ferment: How’s the new brewery shaping up? We’ve settled in very well – it feels like we’ve been here forever, though it’s only been nine months. In that time we’ve already expanded quite significantly. We’ve had to install four new 60bbl FVs (All of our others were 30bbl prior to that) and we’re getting some more open-top fermenters in too for our cask stuff. The biggest expansion though is the purchase of the unit across the road. It’s pretty much as large as the existing site, and we’re currently looking into uses for it; some of it is used for much-needed warehousing space, but the rest is to be confirmed. We had to secure it to ensure we had room to grow in the long term, as we’re already reaching a few limits here. Capacity aside, what can you do now that wasn’t possiblE at the old site? Flexibility was a key aim. The extra capacity has certainly helped, but a bigger contributor was the fact that we’ve got two brewhouses. It’s a dual stream brewery with two 30bbl mash tuns and coppers, so we can brew 60bbl at a time, but have the flexibility to brew two different beers at once. That’s been key for us to ensure we keep everything people love in stock. Another big change has been canning. We’d never canned before and wanted to wait until we could do it in-house. Quality is so important to us – it’s how we build our reputation – so it didn’t make sense to put all that hard work into planning and brewing the beer only to hand it over to a third party and trust that they would handle it with the same care and attention we would. Our beer is our baby, so we wanted complete control. We’ve recently invested in a centrifuge which allows us to further ensure quality in our small pack and keg beers, without stripping away any flavour at all. We work hard to put the flavour into the beer, so we don’t want to take any out. What have been the beer highlights over the past 12 months? I think for me personally, Dutty has been a big highlight. It’s probably my go-to beer now. We’ve had a really big response from the Stay Puft variations we’ve put out. Imperial Puft takes things up to 9% and gives those big sticky flavours a thick, heavy body to match it, and Chocolate Stay Puft is pure s’mores, it really suits cask. We’re really proud of the birthday collabs we released in February. Particular highlights I think were Cheeky V (a vimmie sour that was dreamt up by the guys in our Cardiff bar) and Didgeridank, a DIPA brewed in collaboration with our friends at Siren. 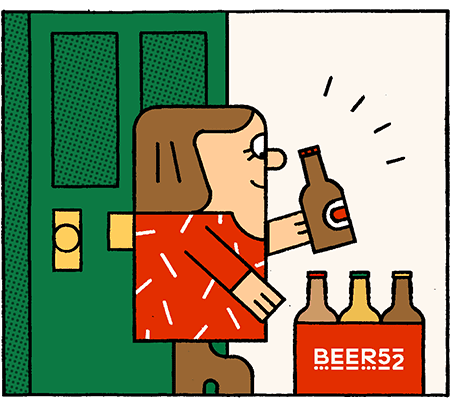 Dutty of course is in the Beer52 box this month. Tell us more about that and Frambuzi. Dutty is a 4.2% Vermont Session IPA. It’s murky as anything and packed full of hops – between two and three times as much hops as any of our other beers. But they’re not jammed in for novelty or to be extreme for extreme’s sake. The balance of resiny, juicy flavours suits the silky-smooth texture perfectly. We’ve let the hops impart a mild bitterness, but the flavour is the star of the show. It’s so good we’re putting it in cask year-round too. If you think cask beer should be crystal clear, the sight is probably going to shock you. But give it a try and you’ll see that the velvety texture of a Vermont is perfect for cask. Frambuzi was our first ever sour beer. It’s a kettle-soured 4.3% raspberry sour. Full to the brim with plump, juicy, sharp raspberries, and with a bit of extra zing. It was first brewed at our old place and we loved it, but it was always just a seasonal. We brought it back for a one-off after we moved, but tasting it again made us want it to stay. There’s more of an interest in sour beers now, and it’s not too sour. It’s the perfect introduction. We haven’t seen many sours in cans and we haven’t seen many in other breweries’ core ranges, so we thought why not? It would be good to have one available year-round as a “go-to”. Any other exciting plans coming up? We’ve never not got something exciting planned. We’ve just launched a mobile game that tells you more about us than marketing blurbs ever could, so we’ll be sharing that with people more and giving them a real experience of our weird little world. We recently launched our online shop so people can get our latest brews and merch as soon as they’re finished, and we’re putting really cool boxes together every month like little Tiny Rebel care packages. New products are constantly in development and, as we edge closer to the warmer months, my mild obsession with gin is creeping in. That might become a pet project to look at in the future. But at the moment tomorrow’s exciting enough, so we’ll see what comes up.